A facial is a skin treatment that can improve or maintain skin appearance and quality. A facial includes a detailed analysis of the skin by a licensed esthetician, followed by a series of cleansing and exfoliating methods. A facial can be light and gentle or use deep pore cleansing. The esthetician will often use steam, hot towels, enzymes, creams and other exfoliates. According to Simadi, the best makeup artist in Kolkata, Facials not only help to remove pollutants and dirt from the face but also help to refresh and replenish the skin. The Natural aging procedure is a common fact but facial can delay the aging system. Dream Bridal can give you the flawless look by their variety of facial treatment. Facials are also called Mukhdikhai in Blue Terra. Mukh Dikhai an important traditional custom done during Hindu Weddings emphasises the importance of face as beauty symbol in our society. 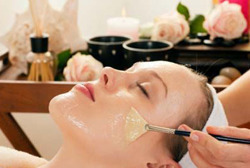 Facials prepare the face for Mukh Dikhai everyday through its combination of Ayurvedic herbs and natural facials. We offer a full range of the latest beauty and grooming services in the areas of hair care, skin care and beauty. The services include specialized services for skin (facials), hair (colouring, cuts, styles, perms etc), hands & feet (advanced manicures and pedicures). Wine facial is loaded with vitamins & antioxidants that deeply cleanse, tone & improve the texture of the skin. Excellent for mature skins. A facial is not just about pampering yourself, it also does wonders for your skin! 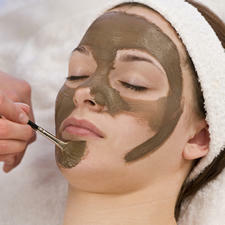 A facial done by a professional, deep cleans and hydrates your skin as well as relieves acne. A good facial also improves blood circulation, giving your skin a healthy glow. An enzymatic treatment to revitalize and renew sensitive skin with uneven skin tone and patchy pigmentation.